Amy Einhorn Books/Putnam, 9780399155604, 336pp. An incredibly original, intelligent novel?a love story set against New York City at the dawn of the mechanical age, featuring Nikola Tesla, Thomas Edison, and J. P. Morgan. Set against the mazelike streets of New York at the dawn of the mechanical age, Peter and Cheri-Anne find themselves wrestling with the nature of history, technology, and the unfolding of time itself. Men ahead of their time wrestle with the fabric of the universe. Flaming's debut ushers into a mystifying world, but its intriguing premise and inherent mystery are impossible to resist. Marrying poetic prose with hints of steampunk aesthetics to an arcane, time-wrenching plot that includes a healthy dose of wistful romance, the author unleashes an absorbing adventure about warring scientists, lost princesses and the genius who created modern New York City. In the present day, an aged narrator describes his dogged research into the collision of two unlikely characters. His confession hints at narrative ambiguity ("Telling the story is easy. It's just deciding which parts to include, finding a space to fit them all in, that gives me trouble. "), but the author's execution is sure-footed. The story within takes readers back to the turn of the century, as Peter Force arrives in Manhattan just in time to start digging the city's newfangled subway system. 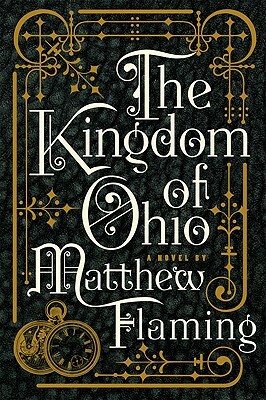 Through his young protagonist's eyes, Flaming captures a city on the cusp of technological revolution, as electricity, airships and other marvels make all futures seem possible. Peter's work is interrupted by Cheri-Anne Toldeo, refugee from a mythical Midwestern kingdon founded by a minor European royal. She blames her sudden appearance on the misfire of a device created by Nicola Tesla, the acclaimed "Sorcerer of Electricity", which has sent her quite astray. The fantastic story line that follows revolves around the heated rivalry between Tesla and his rival, genius/patent thief Thomas Edison, who is being backed here by robber baron J.P. Morgan. "Villainy is a complicated thing, Miss Toledo," Morgan says, revealing a plot to gamble against the future. Though not as lush as Kurt Andersen's Heyday (2007), Flaming's wildly inventive fantasy is more fun to read and begs to be followed to its hurtly, heart-rending end. A marvelous fable about the worlds beneath our feet and the conspiracies that turn our heads. "Absorbed by the twists and turns of the story, I felt like applauding every new idea, every conversation, every mystery, and every revelation! A memorable novel that makes me want to read much more of Mr. Flaming!" "A beautiful fable about love, time, technology, and the birth of America."